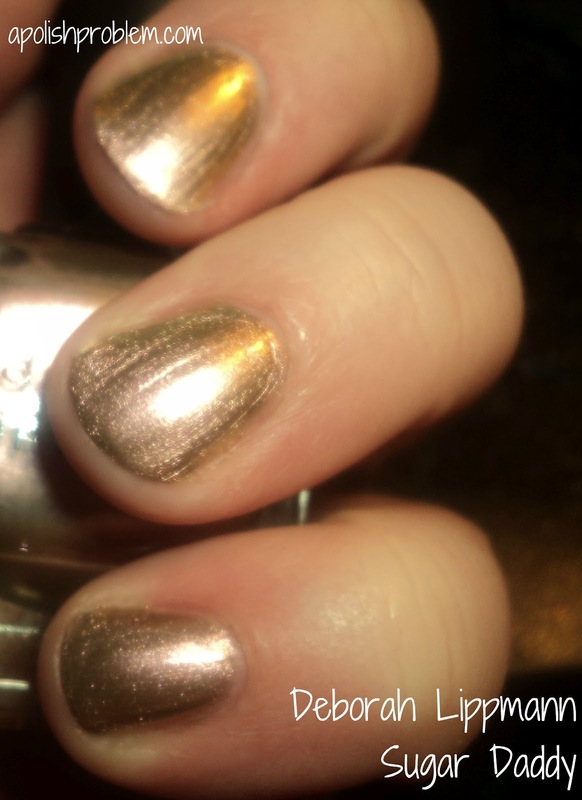 This is 3 coats of Sugar Daddy with one coat of Nubar Diamont topcoat. Recently, Deborah Lippmann offered 6 nail polishes at 50% through Good Morning America's Steals and Deals. The 6 polishes were understated shades to commemorate the one-year anniversary of the royal wedding. Two of them were pale, sheer pinks, and two of them I had already, so I had to pass on those, but I was sure to pick up Some Enchanted Evening and Sugar Daddy. With shipping, which was admittedly high, I still spent less than the cost of 2 Lippmann polishes at full-retail. I think I paid around $23 for both. As I was lemming both polishes, I considered it a bargain. Sugar Daddy is one of the new mirrored chromes being offered by Deborah Lippmann. It is a rose/champagne gold chrome with a green flash (you can see the green the best in the bottle in the second picture). The finish on this one is extremely shiny and very reflective. Given how pretty this one was, I am definitely going to get the other two, Private Dancer and Swagga Like Us. Brushstroke issues aside, this is still a gorgeous polish. I did think it was going to be more rose-gold than champagne, and have a tad stronger green flash, but those are small issues. It's still really, really pretty. Sugar Daddy is available on Deborah Lippmann's website, though recently the mirrored chrome polishes have become available at other outlets, such as Neiman Marcus and What She Buys. Retail price is $18 a bottle. Deborah Lippmann Sugar Daddy was purchased by me during the GMA Steals and Deals event. The above links are not affiliate links. nice color. i like the metallic. Your hard work paid off, this looks amazingly smooth. Sugar Daddy is by far my favorite of this trio. I'm wearing 'Ray of Light' right now - so gorgeous and worth the crazy price. I also have 'Sweet Dreams' and 'Mermaid's Dreams' which are both stunning. When I buy Lippmann I just tell myself, "Could be worse. Could be Chanel." I'm glad to hear you like Ray of Light. I've been waffling with that one, and I think I may just have to pick it up soon. Lippmanns are quickly becoming my higher-end-polish brand of choice. I think I've purchased 5 or 6 in the last 2 months. I'm currently wishing for a magnetic set, the Run the World collection, Ray of Light, and the 2 other mirror chrome polishes. All that and I'm on a no-buy. LOL. Thank you. I really like Sugar Daddy. I have to get the other 2 before I can declare a favorite, and yes... that is reasoning to buy 2 more polishes. LOL. Thank you. I really love the finish on this one.